Combining passionate intensity with an undeniable melodic maturity, Seattle's The Myriad present a fascinating sound reminiscent of the grandiose fearlessness of Muse to the energetic dance rock of Franz Ferdinand. 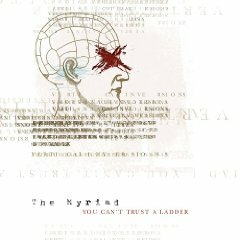 With an eye on reaching epic magnitudes while still maintaining a deeply personal substructure, Jeremy Edwardson, John Roger Schofield, Steven Tracy, Jonathan Young and Scott Davis crafted a stunning album in their 2005 Floodgate release You Can't Trust a Ladder. "For us, ladders represent short cuts," says Steven Tracy (guitar, keys). "The amazing parts of life are lived going through them, not around them. It takes a special courage to walk into a mess, courage that I wish I always had, but ultimately that is were hope and beauty exist. We can find them if we're open to a little battle." 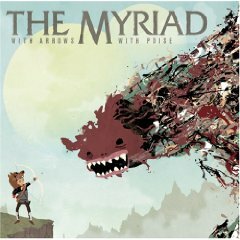 Like a stealthy archer ready to take a clean shot with an arrow at the right moment, so was The Myriad with the creation of their followup album "With Arrows, With Poise". 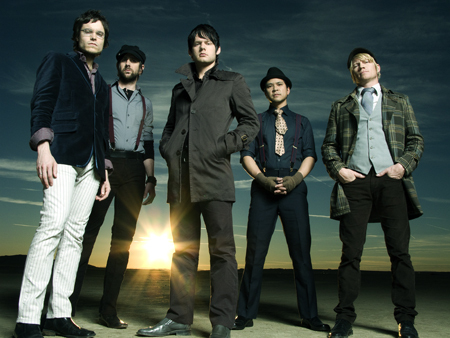 After winning the MTV2 “Dew Circuit Breakout” in December, the band’s May 2008 release was food for a public ravenous for more of The Myriad. “It felt like we needed to take a moment and decide what it was that we needed to do. We identified with the archery metaphor—where everything must be very precise and accurate. You have one moment to take that shot and you’re doing it with poise in-between your own heartbeats and breaths. It was that idea; this is the moment that we really have to capitalize on, this is what we have to do. That set the tone for the whole album,” passionately shares Steven Tracy. “A Clean Shot”, the first single and music video from the album, was also the song The Myriad sang live in the TRL studios in the heart of New York City ’s Times Square upon winning MTV2’s contest. “The weird part is that there was this giant screen in Times Square right behind us, so as I’m playing, sometimes I’d turn around and see myself on this huge screen outside the studio and everyone’s watching it. That’s when it became real,” shares Steven. “We just try to speak to the world. We’re not speaking to any particular group of people, whether it be lyrically or just hanging out. When Jesus Christ came down, He was hanging with everyone. It didn’t matter what your economic status, your background, whether you were part of the government or not, whether you were a Pharisee or a Sadducee, He just wanted to hang with people because He loved them,” says Jonathan. Generally frustrated with the market distinction between Christian and secular music, Jonathan says, “I love go to into museums, whether the MFA ( Museum of Fine Arts ) in Boston or the Met (Metropolitan Museum of Art in NYC). When you look at a piece of art, like a painting or a sculpture, you’re mesmerized that this kind of beauty can exist in this life. Most people don’t say, ‘I wonder if he’s a Christian’ or ‘I wonder what his belief system is.’ They’re just enjoying that piece of work right there as it is. It makes me wonder why in music there’s a different set of guidelines.” He sighs and goes on to say that it’s human nature to nomenclature everything and urges people to utilize their critical thinking skills. "There are moments in art, whether it's music, sculpture, painting, film or whatever, where you get the sense of something greater being part of the motivation to create," says Steven. "When you watch a film and the hairs on your neck stand up, or you look at a painting and want to climb inside of it... all of sudden it becomes as much your's as the artist's. If people leave our shows feeling a sense of connection, of ownership; there is no greater feeling than that for us."